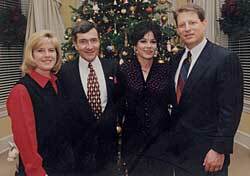 Al & Tipper Gore with Cate Stetson and Rick West. Stetson Law Offices, P.C. has a nationally known commitment to tribal arts and culture. Our art collection exemplifies the firm’s awareness and appreciation, and surrounds our clients and guests with both beauty and constant reminders of tribal prospective. The art serves as a fitting backdrop to Tribal Council meetings, political events, and our daily life and work. Cate Stetson always has been an avid supporter of Native American Arts, counting among her clients and friends Indian artists nationwide. Cate has served as a Director for the Southwest Association for Indian Arts, which produces Santa Fe’s legendary Indian Market, as well as a member of the New Mexico Women in the Arts Advisory Council; as Chair and Board Member for Bien Mur, Sandia Pueblo’s arts and crafts enterprise; and as Officer and regent of the Museum of New Mexico. While the managing partner of Gover, Stetson and Williams, P.C., Cate was instrumental in developing that firm’s collection of Indian art, including works of such artists as sculptors Cloud Eagle and Allan Houser (deceased), painters Helen Hardin (deceased) and Fritz Scholder (deceased), photographer Lee Marmon, and potter Lonnie Vigil. Examples of the collection were featured on the cover and throughout the issue of one of the American Bar Association’s publications on tribal resources. Stetson has since added to the extensive collection pieces by contemporary Southwest Indian artists such as Dan Namingha, Dan Lomahaftewa (deceased), Shonto Begay, Doug Coffin, and Tony Abeyta.